Home Sweet Home, this Norman Rockwell painting, appeared on the cover of Life Magazine published August 23, 1923. The alternate title for this illustration is Man on Ship with Accordion. 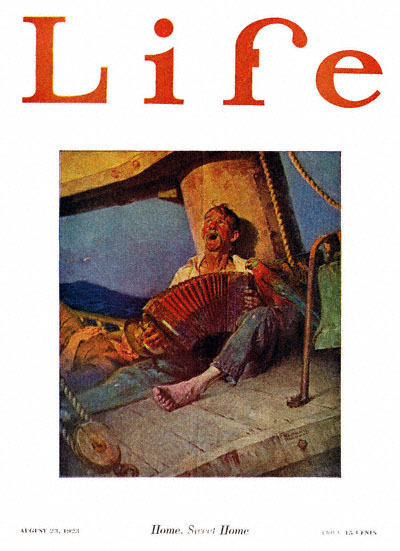 This was the twenty-sixth cover by Rockwell to appear on Life Magazine. A Rockwell painting only appeared twice on Life magazine's cover in 1923 and twenty-eight times in all. The first Norman Rockwell Life cover, T'aint You was published on May 10, 1917 and the last cover, Girl Scouts Number on November 6 1924. The original oil on canvas painting, 30.5 x 26.5 inches or 76 x 66 cm, is part of a private collection. The original painting was sold for $361,000 on November 28, 2007 at auction by Sotheby's in New York City. This sales price was well within the pre-auction estimate of $300,00 to $500,000. This illustration is reproduced on page 45 and as color plate 8 of Norman Rockwell, A Definitive Catalogue by Laurie Norton Moffatt. Ah, sweet dreams of home! This sailor is wishing he were home. He is on a sailboat. Ocean voyages are lengthy enough on ships with engines. But a sailboat takes even longer. No doubt he misses his family more than he misses his actual house. Family plus house equals home. Today he is playing the accordion and leaning on the main sail mast. His parrot is accompanying him. It must be one of those days at sea when the ships goes mostly on its own. One of the other sailors is asleep on the deck next to the accordion player. I wonder who sounds better, the sailor or the parrot.